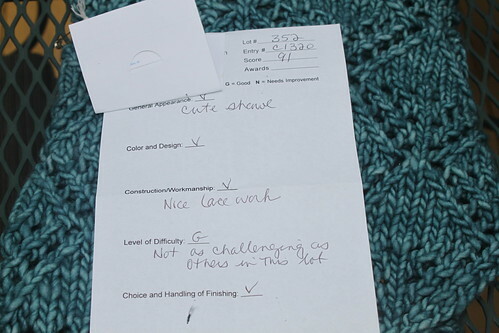 First off, I picked my knitted objects from the State Fair and these were the feedback given. 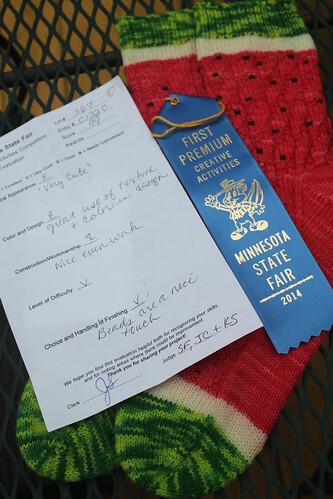 The two first place items scored 99 each, the 3rd place scored 97. I wonder how to get 100. HAHA! One conclusion I've made is I'm going to show them I know how to kitchener! I'm going to kitchener any socks I'm going to submit to the State Fair so they have NO EXCUSE!! LOL! Look at the last one.. I scored Excellent for everything and it's 99... I almost feel like they look at the lot and pick out which ones they think should ribbon.. Then, they go back and critique what's wrong - if they don't ribbon. So, my thought is anything I submit has to have a color that is pleasing to most... well, there's next year to determine that!! 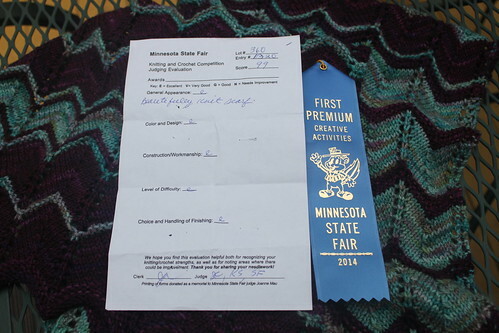 Every item I knit now will have the question, "Is this State Fair worthy?" so I will do a better job at what I knit. 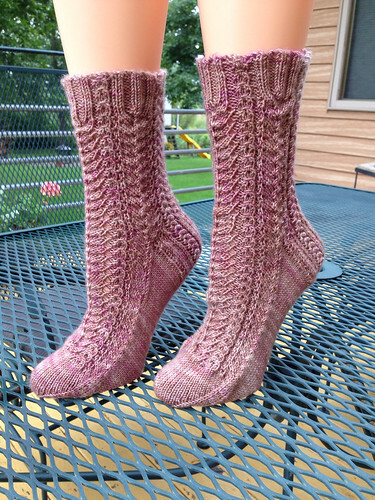 and the final pair was a Hazel Knits Mystery Sock from 2011. 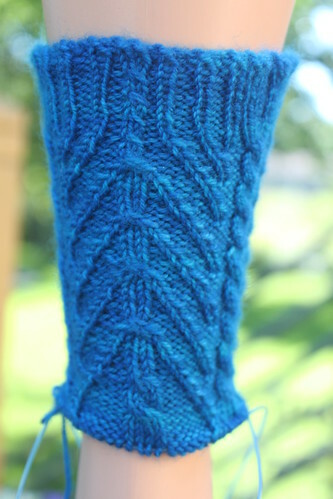 The heel is very different as you can see in my next post. The heel flap/gusset flares out at the back. I also started Slingback by Yarnissima. I keep calling it Sling Blade like in the movie with Billy Bob Thorton - and his taters. 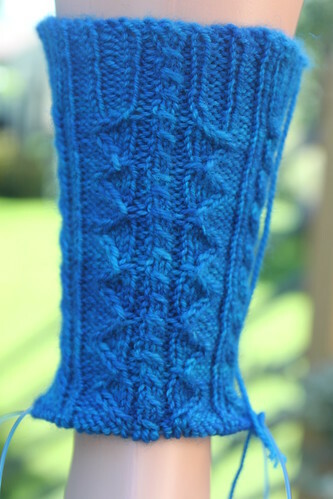 I thought I have a newer photo as I've completed the heel flap and am knitting the leg. Oh well, perhaps next time, I can show you that I've completed ONE sock! While we are on the subject of socks, I bought a drawer system by Elfa. The short drawers are perfect for my socks, which have overgrown my baskets. 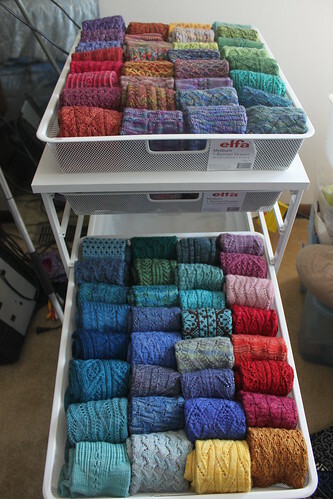 Each drawer can hold 32 pairs of socks. The ones on top (on the right, including the watermelon socks) are going to Emily. I still need another drawer! 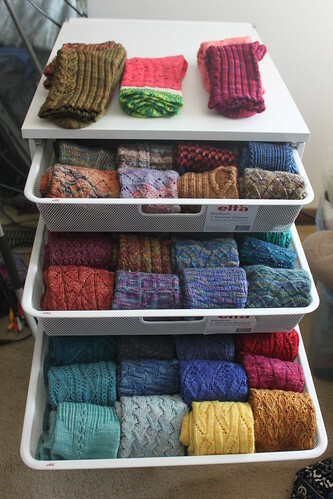 Then, when once I fill out the 4th drawer, I think I have enough socks, but what am I going to do with all the sock yarn I have???? Shawls? Sweaters? Designing so I only have to finish 1 sock? If I really wanted, I can put all the blue socks in one drawer, pink/reds in another, ,but I just wanted to fill the drawers up quickly for the photoshoot. 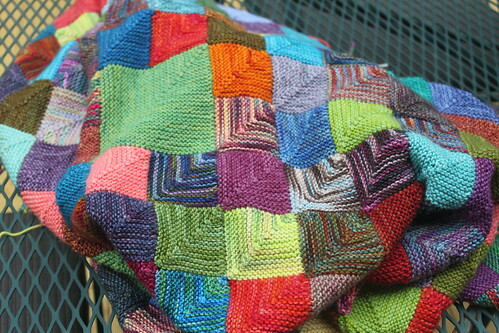 And finally, I decided it's time I worked on my Mitered Squares blanket. I've desserted it for over a year. 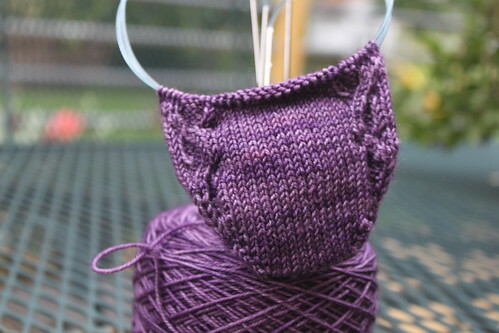 Though my goal is to finish it by Dec. 31, 2016, I'm hardly into 1/2 of the size I had originally planned. 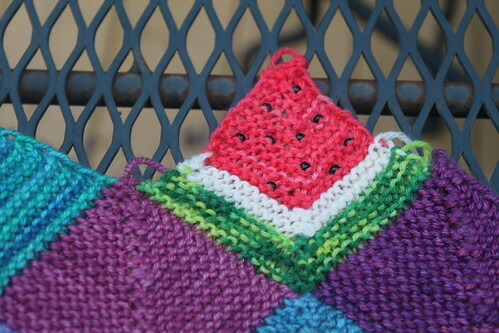 As of Aug 31, I have knitted 342 squares. 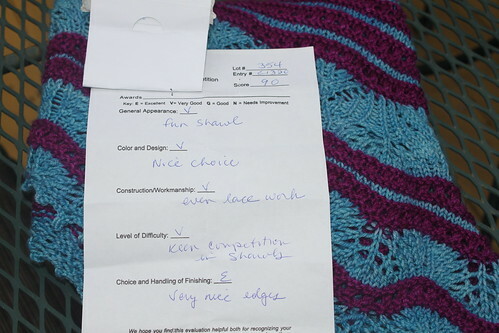 But my efforts did go to the Crocheted Hexagon blanket for the last year (oops, two!). Is anyone still reading my blog, other than Dianne, Pinky, Susan from Buffalo? Drop a comment to say hi or message me on Ravelry. So what is Instagram? I should ask my kids... but I feel like blogging gives me a record of what I did. I do go back and reference my posts for "research"... So I'm going to continue blogging.. I posted a few knitted stories on Facebook and all I get from my non-knitter friends are "Can you knit me a pair of socks?" so forget it! No one asked me to teach them how to knit! I still read your blog! Instagram is a fun way to share snapshots, I really love it, but it does not replace a blog. It's great for a quick fix of yarn-y goodness but blogs are better for sharing techniques, stories, patterns, inspiration, etc. Don't stop blogging! I love your work, how quickly you complete projects, and your ever growing yarn stash...ooooooh. 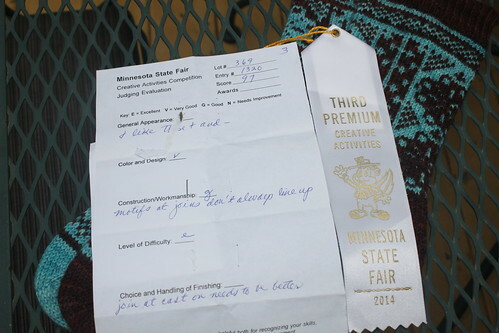 Congrats on the Fair ribbons. Members of my family have been submitting food items for years. You have given me the inspiration to give it a shot! It's me, Pinky (Amphibiaknitter). I'm still a loyal reader. I love the blog. Blogging is different from Instagram. Instagram is more down and dirty with not much text. I like them both, but they fulfill different purposes. I absolutely think you should get on Instagram, but I absolutely don't think you should stop blogging. Interesting judges' comments. I have no idea what you would have to do to get a 100 on anything. I love those sock drawers. I think that's a fascinating idea. I also love how tidy you keep your socks. I put mine together and then roll them into an inside-out ball. But you block your socks after washing them - I just hang them to dry and let them block on my feet. Hi I'm Jo-ann (ninja-knitter on Rav). I read your blog from the wilds of Australia (I found it from amphibiaknits blog one random day). I love blogging too. I'm not on instagram as I don't have a smart phone and you need to use the app to set up an account. Blooging for me is telling stories. Hi! I'm Jennifer and I love your blog! I don't do social media except for Ravelry so if you stop blogging, I'll never find you. Please don't stop! I'm still here, Christine. (HLMauera on Ravelry, Kristin otherwise). I missed you while you were traveling this summer so don't give up the blog. I just recent discovered your blog. Love those watermelon socks! I don't tough FB or Instagram, which FB owns. Only on Rav (amclain). Blogs seems to be disappearing these days. Would hate to have a new-to-me blog vanish before I could enjoy it. I read Christine! I just don't comment much. I hope you don't think this is weird but,I check everyday to see if you've posted! Love your blog! BTW I live pretty close to that place they make those baskets you like in Ohio. Last I heard they have charter bus tours to the factory. I've heard from several people that the building is shaped like a giant basket. Have you been? I'm loving your drawers. I need to reorganize my sock drawer and make more room, because I don't think I'll stop knitting socks any time soon. 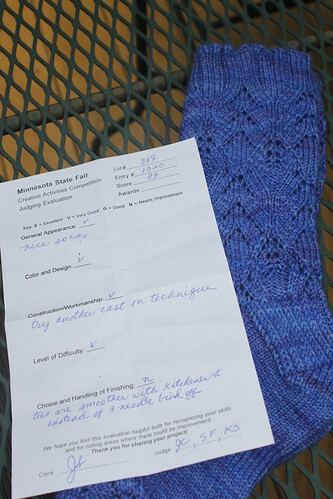 I'm curious about the judges comments about trying a different cast on for your socks. What cast on do you typically use? Came here from the Attic 24 blog. What lovely work! I would find the 99 score irritating too - did you see any scores that were perfect? My sister asked me to make her a particular cardigan (because it looked easy). I offered to teach her how...haven't had any requests since! I wish I could knit socks. They are all sooooo pretty! Keep up your enjoyable blog. What an inspiration on knitting socks!! I have just come across your blog. 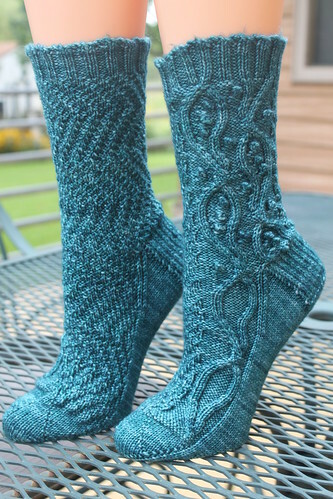 Your socks are beautiful and I am a fan of the 3-needle bind-off! First time visitor - I was lured by your amazing sock drawers (seen on Attic 24). You've knit so many pairs of socks! Amazing. Also - I'm intrigued by your State Fair experience. I've always wondered about entering something in our local fair. Sorry Christine I gave an incorrect email in my comment above. Correct one added. PennyP UK.